Last year, I brought you a review of the luxurious Lincoln MKX, which I was privileged enough to be allowed to borrow on my way to and from the Consumer Electronics Show (CES) in Las Vegas. 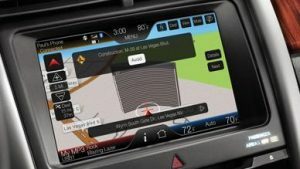 You can find my Editor’s Choice article about it here:http://computertimes.com/2011fordlincolnvehicletechnology.htm. This year, Ford Motor Company was kind enough to loan me another vehicle for my commute, and I am pleased to report that it impressed me just as much as the MKX. I drove a 2012 Ford Edge this time around, and discovered all the great features it has to offer. I was also able to meet with several representatives from the company and get the scoop on some other exciting news from Ford. Take a closer look at the on-board technology of today’s Ford vehicles, as well as a sneak peak at tomorrow’s. First off, let’s talk about the Ford Edge itself. The Edge is a mid-sized vehicle, outfitted with enough comforts and features to make it seem like a luxury model, but with an affordable price tag. Starting at $27,770, there are 4 models to choose from: SE, SEL, Limited, and Sport. Some of the features referenced in this article are only available in certain models. 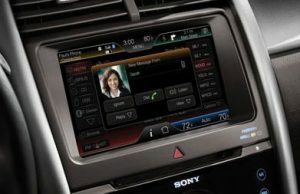 SYNC with MyFord Touch is the central operating system for all of your entertainment and accessibility needs. The 8-inch touch screen is divided into 4 main areas to control Climate, Audio, Phone, and Navigation. You can use the touch controls, or the voice controls for all of these functions. Adjust the climate for the whole cabin, or individually for the driver, passenger, and rear seats. Enjoy some tunes with the CD player, Sirius XM radio, or sync up your MP3 player or phone for your personal playlists. You’ll hear all of your music through high quality Sony speakers. When you sync your phone, you can also import your phone book for voice dialing, one touch dialing, and call logs. The navigation system can be a little fiddly, to be honest, but once you work out its quirks, you and your GPS will get along just fine. You can type in your destination, speak it, or search for points of interest. For comfort and safety, the Edge shares some of the cool features I wrote about last year. The driver’s seat is fully adjustable, with 2 preset buttons, so that you can program the perfect seat arrangement for 2 separate drivers. All you need to do is push the preset button and the seat will automatically adjust to that setting. The seats are also heated, which is a nice treat on a frosty morning. The front windshield wipers can sense the intensity of the rainfall and adjust wiper speed accordingly. The BLIS (Blind Spot Information System) is great. A light will illuminate in your side view mirror when a car is in your blind spot on that side of the car. This is useful not only on the road, but when you are backing out of a parking spot with limited visibility. 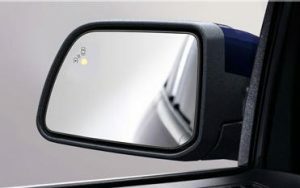 The rear view camera is particularly helpful here too, as it gives you a clear view of the area immediately behind your back bumper when the car is in reverse. There are visual aids on the touch screen as well as warning sounds when you start to get too close to whatever is within the camera’s view. The adaptive cruise control remains one of my favorite safety features, and I tell people about it often. I don’t think I’ll buy a car in the future without it. Not only can you set your desired speed, but the distance buffer between you and any cars in front of you too. When the Edge detects that you are getting too close to the rear end of a car in front of you, it will slow down to match that car’s speed. When the car moves out of your lane, it will bump the speed back up to you cruising speed. This is as close to a car driving itself that you can get. So cool! The collision warning system will alert you if the sensors feel a crash is anticipated with the car in front of you. You will both see and hear a warning alarm, and the break sensitivity will increase to be as responsive as possible when you put your foot down on them. The Edge comes with Intelligent Access and a push-button starter. If you approach the driver’s door with the key remote close at hand, the door will automatically unlock. This is a neat feature, unless you are a slightly paranoid person and like to check to make sure the door is locked (like me) before walking away. You can’t really do that, unless you feel like tossing your keys a few feet away before trying the handle. I actually did that once…and felt very silly about it. The car does give you a reassuring beep when you set the alarm, so even people like me can feel secure. You can open and close the lift gate with the touch of a button on the remote, which is extremely convenient when you have an armful of groceries or 6 bags of convention swag. Once you are inside the car, no key is needed to get going. Just step on the brake and push the ignition button. I have to say I really like this feature. 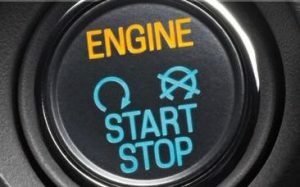 Even though this push-button ignition technology has been out for a few years now, I always feel like I’m about to drive away in some cool space age vehicle. Another pretty awesome start-up feature is the ability to set your climate controls to warm up your car when you power it on using your remote, while you are still outside of it. The car’s battery will turn on but will remain locked. So, you can get your cabin all toasty while you finish getting ready for work, without worrying about someone stealing your Edge. You can also get the MyKey function, for the teen drivers in your household. With this, you can set the maximum speed the car can go, turn on the Belt Minderwarning chime when the seat belts aren’t engaged, limit the audio system’s volume, and raise the level at which you are notified that your fuel is getting low. Speaking of fuel, the Easy Fuel capless fuel tank prevents you from ever forgetting to recap your tank and letting gas evaporate. After you remove the fuel pump, the tank reseals itself. This saves fuel and also limits harmful emissions. You can set your dash display to show how many miles you have left before the tank is empty. 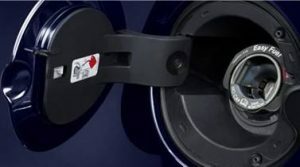 You will also get an alert when you are dangerously low on fuel and need to fill up soon. This is such a helpful features and takes all the guesswork and worry out of when to fill up. You’ll get increased fuel economy with the available EcoBoostengine technology, which provides more efficient fuel consumption through direct injection. With this option, you’ll get about 30 mpg on the highway. Wow! Now, let’s get into some of the other announcements from Ford at this year’s CES. 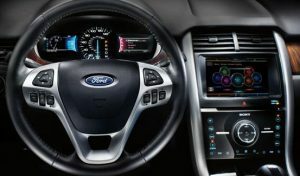 The MyFord Touch system will get a facelift in the 2013 models, and will be available as a free upgrade to existing MyFord Touch owners. It will feature not only a new look, but new features and a sleeker interface. More to come on that next year when I can get a full hands on experience. The SYNC AppLink system, which gives smart phone users voice control over their phone apps, is launching a number of new apps for on-board usage in their vehicles. A huge partnership with NPR lets you listen to your favorite local NPR station, from anywhere in the country, all through voice control. Not only can you choose the station, you can search for specific radio shows as well, and listen to either the currently broadcasting episode, or one you’ve missed. NPR is the first major news organization to release an in-car app, but I’m sure they won’t be the last. You can get this app for Android or iOS. Roximity, a location-aware deal finder, is another new app to have been featured at the show. You can set your preferences, like which restaurants you frequent, and will be notified when the app detects a local deal that would suit you. You can get voice controlled, fast access to traffic reports, destination highlights, and improved turn-by-turn directions with the SYNC Destinations app. This app allows you to have more control over your journey, and have a better understanding of what to expect along the way. Look out for even more exciting SYNC AppLink apps to come. As you can see, some very exciting things are happening at Ford, and will continue to happen into next year. Not only do you have the improved MyFord Touch and the new SYNC AppLink apps to look forward to, you can enjoy the comfort, design, and technology of the spectacular 2012 Ford Edge right now! The Edge is, of course, not the only great new model in the Ford fleet, not to mention those extra luxurious models in their sister fleet at Lincoln. I said it last year, and I’ll say it again: after driving these new models, I have become a fully converted member of the Fordfan club. Please, go test drive an Edge or another Ford/Lincoln vehicle, and see for yourself what all the fuss is about. I’m sure you’ll be as impressed as I have been.